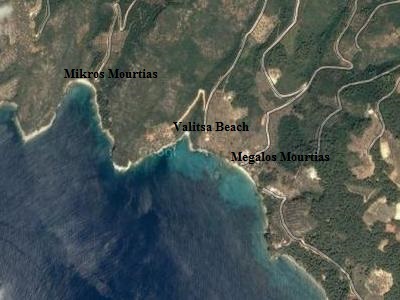 The beachof Valitsa on the island of Alonissos in Greece, information and pictures. Valitsa Beach is located in the south of the island of Alonissos. It is a small pebble beach that lies between the beaches and Megalos Mourtias and Mikro Mourtias and it is accessible via a path. In the coast of the beach are quite a few rocks, so it's not so easy to get into the sea here. Just like the other beaches in this bay, Valitsa beach usually lies well prtected from the wind. At the small beach Of Valitsa you cannot rent umbrellas and sunbeds and there are also no other facilities. If you are looking for sunbeds or something to eat it is better to go to nearby beaches such as Marpounta Beach or Megalos Moutias Beach, where you do have these facilities. These beaches are better. You head to Valitsa Beach for peace and quiet.